My first experience with Dragon Quest V was a little embarrassing. In high school, I tried my hand at the game for over an hour but couldn’t even make it past the first area. After talking to every NPC, searching every bookshelf and chest – all to no avail – I finally resorted to an online guide (purists forgive me). Pirate players of DQV don’t get to see or explore anything beyond this initial area. Considering the notorious difficulty of “old-school” JRPGs, my troubles would have actually been par for the course for games of this genre. DQV and many titles like it extend their already epic playtimes by refusing to guide the player any more than necessary. And when these games do offer direction, it’s often in the form of a cryptic or easy-to-miss piece of advice: a villager hints that a ghost only appears at night, or an in-game tome reveals the secret weak point of a boss enemy. Alas, my inability to progress past the first scene had nothing to do with my Dragon Quest V’s difficulty nor my own inability to hurdle it. This was, though, still a case of JRPG developers withholding information from a clueless player. I learned from the online walkthrough that when dev team ArtePiazza ported DQV from its home on the SNES to the Nintendo DS handheld, they inserted an intentional glitch to impede the progress of players who pirated the game. Essentially, DQV‘s code contains a series of authenticity tests, and if the game fails these, the game blocks the player from moving beyond the first area. In legitimate copies, the first chapter closes via a cutscene where the boat docks and the player ventures forth; in illicit copies like my own, that event simply isn’t triggered, so us pirates are fittingly stuck at sea for the duration of our playtime. Anti-piracy measures in video games like DQV’s endless boat ride are not uncommon. In pirated copies of Chrono Trigger DS – another SNES-to-DS port of a classic JRPG – a typically 5-second long animation of a wormhole instead loops forever. Some games punish pirates by ratcheting up the difficulty (see: Earthbound), while others opt for a more whimsical approach (see: Alan Wake, which slaps a fun pirate patch on the main character’s face). Game-publishing simulator Game Dev Tycoon goes meta by blocking thieving players from turning an in-game profit. These mechanisms are, in my opinion, a purer example of video games pulling pranks than the ones Ian Bogost describes in his chapter on the same topic. Here, Bogost cites Easter eggs and parody games as the videogame equivalent of pranks (38-39). I agree that these mechanisms do replicate the joking or mocking attitude found in most real-world pranks, but they ultimately fail to capture something that I consider an essential element: the uneven power dynamic between the prankster and the victim. In most pranks, the prankster enjoys a moment – however brief – of complete control and total knowledge over the situation. Meanwhile, the victim of the prank is helpless and clueless, stuck pondering why the doorknobs are so slippery, why the mouse won’t work, or why this damned game can’t seem to load. The victim is saved only by a sudden “a-ha!” understanding of the situation, or by the prankster revealing his/her work – whichever comes first. I certainly had that shameful epiphany when I learned about DQV’s infinite boat ride glitch, and while I couldn’t spin around to find the game’s developers giggling at my struggle (or just grinning vindictively, more likely), I’d like to imagine they had a similar, preemptive satisfaction when they added the glitch to the game’s code. This time around, I’m playing DQV on a legitimate DS cartridge, not a downloaded ROM file. I can’t honestly claim that the developers’ prank swayed me from my pirating ways entirely, but their effort did alert me to the human developers behind the game, and to the human pranksters chuckling in the next cubicle over. For consumers like myself, who try to justify ‘casual’ piracy by claiming that an already wealthy company/record label/developer surely won’t miss a few extra bucks, that reminder is sometimes enough. Bogost, Ian. “Pranks.” How to Do Things with Videogames. U of Minnesota P, 2011, 37-44. Print. In his essay on gamic action, Alexander Galloway notes that many turn-based role-playing games (RPGs) and strategy games are essentially games of menu navigation, wherein most or all gameplay takes place within menus (14). This is certainly the case for Square Enix’s 1992 RPG classic for the SNES, Dragon Quest V: The Hand of the Heavenly Bride (henceforth abbreviated to DQV). Much like early entries in its sister series Final Fantasy, players coordinate and complete battles in DQV by issuing commands to their party members. Players choose from “Fight”, “Tactics”, or “Flee” at the start of each turn; once the party’s actions are locked in, the protagonists and enemies trade blows until one side falls. Interestingly, DQV (and most other games in the Dragon Quest series) renders battles from a first-person perspective. High-quality pixel portraits of demon foes confront the player, and enemy attack animations gradually grow in size to create an illusion of moving through the screen and toward the player. Similarly, the protagonists’ own attack animations emanate not from sprites of the heroes (which are never shown during battle) but from thin air, as if the player himself/herself is wielding the whip, staff, or axe. 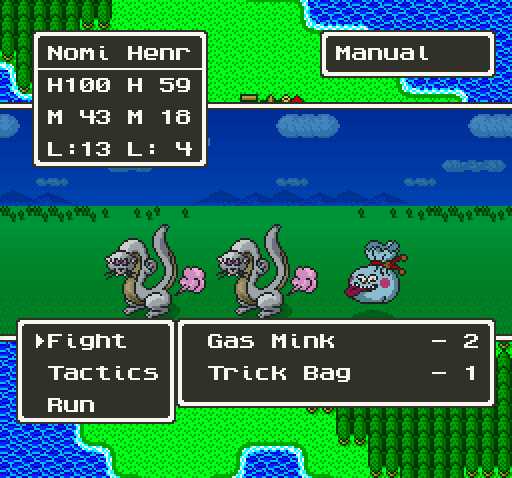 This setup stands in marked contrast to the battle scenes of early Final Fantasy games, which display both the player’s party and any enemies meeting on the battlefield. I could certainly write an entire game log entry on the effects of having DQV’s enemies face and attack the player directly, and of the heightened identification this induces with the game’s protagonists. However, I’d actually like to zero in on a particular scene, where DQV exploits its first-person battle perspective to heighten the tragedy of an early plot twist. DQV’s story spans the entire lifetime of the game’s silent Hero (capitalized here because the player does get to choose the protagonist’s first name), so at least a little exposition is necessary for me to explain the scene I have in mind. The game’s first few hours depict the Hero’s childhood as he embarks on incrementally more exciting adventures, from freeing a helpless villager trapped under a boulder, to saving a tortured wildcat kitten, to ridding a haunted castle of its ghosts. This first act concludes with the biggest adventure yet: the Hero has traveled to the royal capital with his father, and within minutes are tasked with retrieving a kidnapped prince. The Hero and father track the kidnappers to their hideout, where the father rescues Harry and tasks his son with guiding the prince out of the cave and back to safety. They are inches away from freedom when a demon lord appears and swiftly defeats the Hero and prince. The father arrives moments too late and engages in battle with the demon lord. At this point, the game transitions unexpectedly from exposition to gameplay, and the player is for the first time handed control of the Hero’s father. Battle proceeds as expected for a few turns, but is then interrupted by a sudden twist: the demon lord scoops up the unconscious Hero and holds a scythe to his neck, daring the father to continue attacking risk his son’s life. Naturally, the selfless father refuses. The game transitions back into the battle screen, but now, the player is robbed of any autonomy. He/she must simply watch as the Hero’s father stands resolute and accepts the demon lord’s attacks. It takes over a minute for the father’s massive health bar to reach zero, at which point the battle concludes and the father dies (permanently and canonically, unlike typical in-battle deaths). It would have been wounding enough to simply show the Hero’s father, up to this point invincible and infallible, suddenly slain in a cinematic interlude. But by transporting the tragic event into the battle screen, the player becomes acutely aware of a number of factors, all of which heighten the scene’s emotional resonance. First, we experience the true resolve of the father’s love for his son as he withstands a barrage of attacks from the villain. Second, our surprise at this narrative twist is compounded by a shift in gameplay, as the typically free battle menu is suddenly converted from a gameplay interface to a mere set piece. Finally, we are aligned with the father and placed in a scenario painfully similar to his own: desperate to act, but forced to endure. Galloway, Alexander. “Gamic Action, Four Moments.” Gaming: Essays on Algorithmic Culture. University of Minnesota Press, 2006.